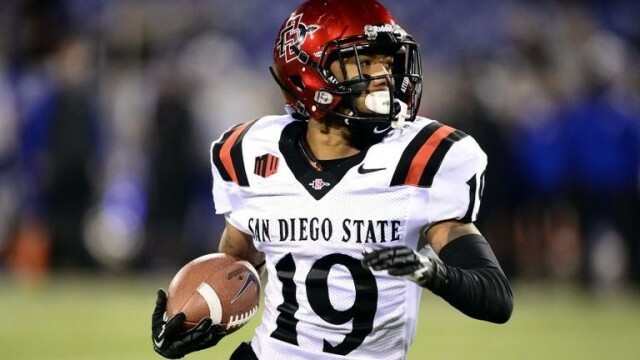 San Diego State junior running back Donnel Pumphrey announced Monday that he will return to school for his senior season. He needs just 318 yards to pass NFL Hall of Fame running back Marshall Faulk as the school’s all-time rushing leader. Pumphrey was an integral part in the team’s run to winning the Mountain West Championship and first 11-win season as a Division I team last year. Last season he rushed for 1,653 yards and 17 touchdowns on 309 attempts on his way to becoming the MW Offensive Player of the year. “I signed up to be here four years, not to leave after three. I’ve had incredible success here, but I want to have another good year, hopefully win another conference championship and graduate as well,” he said. Other records Pumphrey trails Faulk in heading into his final season include: rushing yards (4,272 (Faulk is at 4,589)), 100-yard rushing games (22 (Faulk is at 23)), rushing touchdowns (45 (Faulk is at 57)), all-purpose yards (5,145 (Faulk is at 5,595)) and total touchdowns (50 (Faulk is at 62)). He’s also the school’s single-season rushing leader with 1,867 yards, breaking George Jones‘ record his sophomore year.